I love lighting, and with as many sales there were this week on lamps and outdoor lighting, and pendants, I thought I would feature lighting this week. Choosing lighting for your home can be very difficult - there are so many different materials that lamps can be made of, never mind colors, and of course, the style of the shade that you choose. In addition to that, choosing the perfect lighting for your home or your outdoor space can be a lot of fun. The different styles that I have chosen for this week's Flash Sale Friday are all over the place. I have everything from super-modern to very traditional and classic, and of course, everything in between. Plus, I had to include an Arch lamp, like the one that D and I recently picked up from a family friend - you all wanted your own anyway, right? I think it's safe to say that in this week's picks, there is something for everyone! Which lights could you see using in your home? Do you think I missed a style in my search? After our thirty-mile drive over from Arches National Park to Canyonlands National Park, D and I grabbed our Subway sandwiches out of the cooler and walked out to the Green River View Overlook, which is about 6 miles from the entrance to the park. The overlook ended up being only a walking path with a barrier between you and the cliff, so we walked a little off to the right to one of the boulders that was alongside the barrier and sat down to eat our lunch. Looking out over the canyon was beautiful, and it was really neat to be able to see the Green River from where we were eating lunch. We didn’t stay too long here because there was a hike that we were planning to make, so we finished up our lunch, and hopped back in the car, only to realize that we probably should have filled up the gas tank before leaving Moab. The closest gas station to Canyonlands was about 20 miles away, and with less than ¼ tank, we figured that it was probably not a good idea to drive the additional 25 miles to the other overlook as planned without having much gas in the tank. 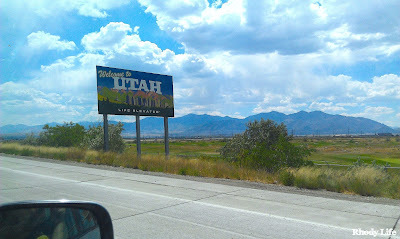 This leads me to a point about Moab – I didn’t realize how far apart things were when I was doing research for the trip. While Arches National Park is about five miles from the center of Moab, Canyonlands is not. In fact, Canyonlands is actually divided in the middle by a canyon – go figure, right? So there are two different sections to the park. The one that we focused on was called Islands in the Sky, whereas the other one is called The Needles. The Needles section has more long and difficult hiking trails and biking paths, whereas the Islands in the Sky section is more driving and smaller hikes. When I was researching the parks, I didn’t realize that the two different sections of Canyonlands were separated by a canyon and therefore did not connect unless you were to travel by boat or raft on the Green River. And to my surprise, the entrance to Islands in the Sky and The Needles are over 100 miles apart! Unfortunately, this meant that we ended up having to choose one over the other and ended up visiting only Islands in the Sky since it was closer and we didn’t have very much time. When we go back in the future, which we plan to do, we will definitely be planning on spending almost all of our time in The Needles section. Ok, back to what I was saying before – we were running low on gas, and we didn’t think that putting the extra miles in would be worth it right then, especially since we were planning to come back the next morning before heading out of town. So, on our way out of the park, we stopped at the short hike that leads you over to the canyon on the East side of the park, where Mesa Arch is. When we got to the parking lot, we noticed that there were a lot of cars there, and when we got to the arch, there were tons of people there. We didn’t end up spending as much time here as we had wished to because of how many people were there, but it was really beautiful, and looking through the arch across the canyon was a very cool thing to see. On our drive back to town to get gas, we decided to head back to the hotel to restock on water and snacks, and then head back into the park to check out some of the other areas that we hadn’t seen yet, and to watch the last sunset we would see in Moab. 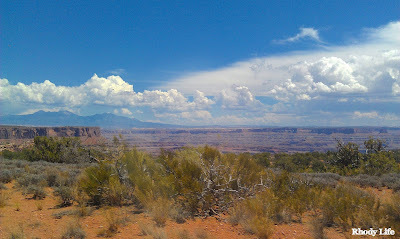 Have any of you ever been to Canyonlands? What are your favorite parts, and which section did you like better, Islands in the Sky or The Needles? Any suggestions on good hikes in The Needles section for when we go back? On our only full day in Moab, Utah, we woke up early ready to tackle the day’s worth of driving and hiking that I had planned for us. After grabbing breakfast in the hotel, we started out our day in Arches National Park, arriving back in the Windows section of the park at 8am. With so much to do that day, we wanted to get an early start, but that ended up working out better than expected, because we hadn’t quite adjusted to Mountain Time yet, so 8am actually felt like 10am! Instead of going over to the arches that we saw the night prior during the sunset, we went over to the West side of that area to where Double Arch is located. Double Arch was incredible, and we were actually able to time it so that we were the only ones there with the exception of the first and last ten minutes of arriving and leaving, and we spent well over an hour climbing the rocks and taking pictures of how beautiful the red stones looked against the blue sky. Having this arch all to ourselves was so peaceful, and really allowed us to capture some of our favorite pictures from the trip, since no one else was in the way of the scenery. After spending much more time at Double Arch than anticipated, we drove North to Devil’s Garden, which is where the campground is and a trail that has about nine different arches along it. I had originally only planned for us to see Landscape Arch, but after coming across it, I wasn’t all that impressed. The pictures that you see online of Landscape Arch are much different than those that you take in person. And yes, I know that quality of camera and being selective of the pictures that the park uses for advertisements make a big difference, but I’m talking about the arch not looking anything like what it did in person. I was kind of disappointed, so we didn’t end up spending much time there, and instead, we hiked further into the trails to see some of the other arches. We ended up stopping at Partition Arch and Navajo Arch, both of which were beautiful. One of the best parts about being in this section of the park was that if you wandered off of the paths a little bit you found yourself in the middle of nowhere and you didn’t have to worry about being around a bunch of other tourists. If you haven’t picked up on it by now, D and I don’t really like being in a big group of people, so avoiding tourists while on vacation is something we really try to do. While we were at the Navajo Arch, we decided to go off trail a little bit and ended up climbing up some boulders, which brought us out onto a ledge that gave us a 180 degree view across the park. It was absolutely stunning, and having it all to ourselves made it even more spectacular. With that view in our minds, it was just about lunchtime, so went back to the car to head out towards Canyonlands National Park, where we planned to eat lunch overlooking one of the canyons. How awesome are these pictures? Doesn’t this make you want to check out the area? It definitely makes me want to go back, that’s for sure! When looking through all of the Flash Sale sites this week, I noticed a theme with office furniture. I've covered a lot of other rooms in previous Flash Sale Fridays, but one of the ones I haven't featured yet is a home office. I took a little spin on this though and gave options for also having a lounging area in the space, just in case you don't have a room that is specifically for your office, you could very easily devote just a corner of your living room or family room to your office, and with just a few pieces of furniture, you could have a great work space off to the side. The black and white colors that I chose for this room bring in a modern vibe, which really works with the modern style of the furniture that I have chosen. The neutral colors also allow for you to accent with color through accessories and wall paint. I chose the bold turquoise color on the wall because it's not too feminine or too masculine, and the color works well with green and yellow accents if you wanted to bring more colors into the space. What color would you pair with black and white? Is this too modern for your style? What would you rather see instead?